We have made a lot of progress in the field of Technology & with this we do experience certain drawbacks. The main drawback includes a Full proof backup solution. Yes, there are many online backup solutions. Most of them are paid. Even if they are free they offer a lot less space than we require. Dropbox is one of them providing only 2 GB of online space for free users. Though the only advantage in Dropbox is that, it allows free users to increase space up to a certain limit by completing certain tasks. Lets now see the 3 Simple ways with which you can increase your Dropbox storage space in order to store more important files online securely and stay tension free. It sounds odd that a website offers something free for just reading, how the website works. But Dropbox does offer 250 MB of space for completing each point of the Getting Started List. We all build a lot of Contacts in GMail, Yahoo!, Hotmail, etc. Those contacts will come handy in increasing your Dropbox Storage Space. 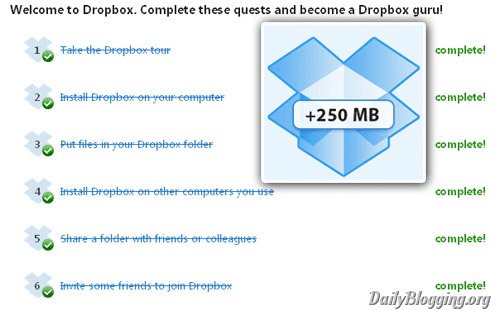 For each referral Dropbox adds up 250 MB of free space. So if you manage to get at least 10-15 Referrals; it will add up to 250*10 = 2500 MB (2.5 GB). It doesn’t stop at 2.5 GB. In case you get more referrals you’re able to extend the space up to a limit of 8 GB. Many of us around here use Twitter & certainly Facebook in order to network with their friends. 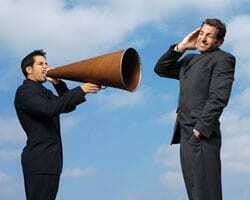 Some use Social Media for promoting their blogs, products, etc. Now, your Social profiles can help you Increase your Dropbox space too. It’s simple, you need to follow Dropbox on their Twitter handle (@dropbox). 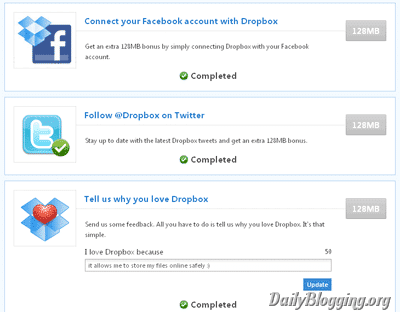 Tweet & Share ‘What you Like about Dropbox’ on your Social profiles. As seen in the Getting Started list, here too we have a list of tasks to perform. For each task you complete, they provide you with 120 MB of storage space. Perform all the 6 tasks present in the list & you will get around 720 MB of free storage space. 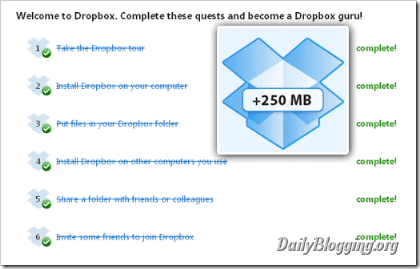 So goto Dropbox Free page & complete the tasks. With all the three steps combined you will be getting around 5 GB of Storage space. That’s more than the double of what Dropbox offers to free users. How much free space have you managed to get on Dropbox ? Do you find Mediafire & Drop.io much better in comparison with Dropbox ?? confused abt third point. Where can i find that social media sharing page ? Sorry! My bad. Missed the link in the post. Now updated it. Dropbox is a very nice tool and I love the Android app. That makes it real easy to have your documents everywhere. You can’t really compare drop.io since the service is down for a while. Drop.io has be bought by Facebook Inc.
Dropbox sounds like a great tool to for an online back up and extend your storage space online. New info for me, will check it. I have 10.5 Gb of space by referring people..I don’t think I’m gng to need more.. But I’m sure for new dropbox user this is going to be useful.. This is a great solution for beginners to 5 years. I have been designing over 8 years and a dedicated server is the best thing I have invested in. I can share and monitor who is downloading what. When I share some of my projects, which does not happen often, I have caught people trying to outsource my project and fired them. To me, this is not fair for developers and designers because they are getting a portion of what they really deserve. If you are a well established designer, the free storage really is not necessary. Nice share. Will try it. well thanks for sharing… in will try it…. I have not used Dropbox before! But this service looks really good, I would like to have an online storage space to keep some of my files. I’m a dropbox user for a good while now. Hey, thanks for recommending these. I have been using Dropbox (free) for a while now and didn’t know they were offering these ways to increase the storage space for free. I am going to try out each step as I could certain use the bit of extra space. Thanks for these tips. I never thought I’d actually use up most of my free Dropbox space but I have and now I’m looking to increase it. I’ll try out these tips to increase my free space as much as I can and if it’s still falling short, I’ll purchase one of their premium schemes and get 50 GB or more. Hopefully, by then, Google will also have their cloud storage service operational. Excellent tips and I am sure it will resolve upto some extent the sapce required for Dropbox users. That makes a total of 5 GB of free Dropbox space!